Keith, what are you doing up there? 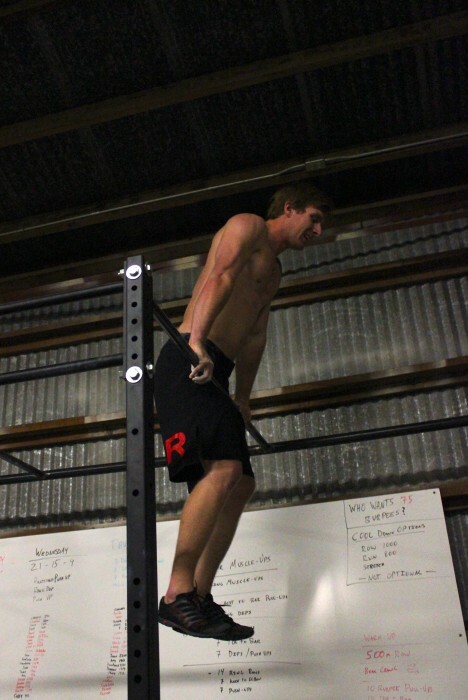 Congrats to those cranking out the bar muscle-ups, Coach and Keith, and especially old man John….damn you. Anyone else (not me), good job. Where’s SmoothD?? Well, I might be push pressing PVC today. I am sore! Way to go guys! Going to try to make it tonight, Allison and I both agreed we need to quit our jobs so we can CrossFit more. Also I’d like to think I’m a 1 1/2, but that’s probably dreaming big haha. Can’t wait to find out what a push press is… See you at noon! Hope to get a bar muscle up some day soon, congrats to those that can do them! Responding to the athletic chart level; I’m more on the Level II, but hit a ton of Level III on the athletic level. I hope we do some jump roping today – my calves are feeling left out as the only muscle that didn’t get sore this week! See y’all at 5:30. Today was tougher than I thought it would be. Went into it thinking I would do better than 1round +37 at 53 pounds. Not great but I’m pretty sure my squats were awesome! As far as the athletic chart I guess I’m not quite a ‘well rounded beginner’. No pull ups or dips for me…yet. Keith you seriously owned it yesterday. . . Kelsey you were super awesome today . . . don’t you worry bout the numbers . . you did it . . thats all that matters. Super Dan I am seriously jelly of your socks . . . Home Skillet your RX made me wish I had tried harder . . Thanks for chillin Big Bri, Kyyyyylllleee and Kelsey. 🙂 And this brings us to 10. Jess out. Thanks 5:30 for hanging out long enough for 6:30 (me) to have a beer with you all after the WOD. Glad that one was only 10 minutes! 1+27Rx for me. Great job everyone. no-rep your squats were awesome! kelsey keep it up you did fine just keep pushing it ! jess way to push it this week! peeps need to remember how they use to feel and how they feel now!!! missing my peeps up here in eureka! went for a run this morning, followed by uphill lunges, air squats, and push ups with my feet elevated on the horse fence. hoping for a long run along the jetty tomorrow with my aunt and uncle. we’ll see if i can keep up with them. according to that chart, i’m an advanced beginner. need to run and row faster! Did better than I thought on those back squats – would like to see a WOD next week with low rep back squats (3s or 5s?) to see what my max is now. Way to go with rx Heather!